This key trend Cheetah animal print jacket is a must in any wardrobe, the unstructured waterfall front will compliment any outfit from season to season. Team this with jeans and pumps for a casual day look or add this to any glitzy evening number to complete your eye catching look. 100% Viscose. Machine washable. 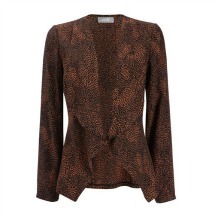 Rust and black animal print waterfall jacket, great lightweight cover up in an on trend print 100% Viscose. Machine washable.